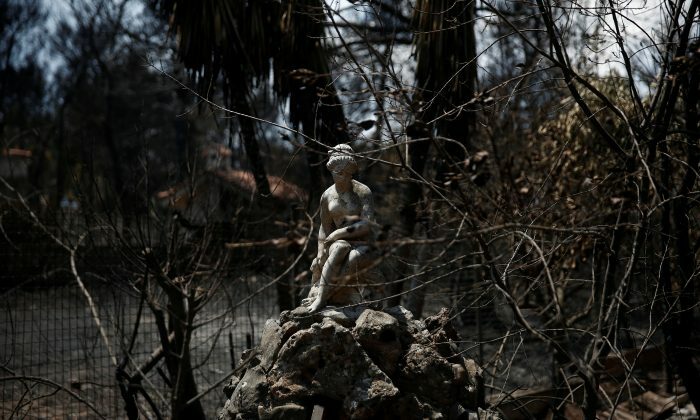 MATI, Greece—Mourners gathered in a church in the Greek coastal town of Mati on July 29 where they wept and lit candles in memory of those killed when a massive wildfire swept through the popular resort near Athens earlier this week. Rescue crews are still looking for survivors of the blaze which began on July 23 in Mati, 17 miles east of Athens, as the death toll rose to at least 91 with dozens more injured. A total of 25 people remain missing whilst 59 bodies have been identified and a further 28 are still to be named, the fire brigade said on July 29. Another four people have died in hospital. Downpours on July 29 hit parts of the region after heavy rainfall and flash floods in areas on July 28, making it harder for the authorities trying to locate survivors and locals hoping to salvage what they can from the disaster. But there were also signs of a return to normality as a children’s camp, which closed due to the blaze, was reopened on July 29. The mayor of Athens invited youngsters affected by the fire to come along.